Welcome to Part 2 of the iOS App Marketing series! Thank you all for your tweets, comments and feedback on part 1, none of this would be possible without your continued support! So let’s get onto the fun stuff. Your app is released… now what? OK, so you’ve finished your app, having researched the competition and created something cooler and better. You spent time polishing the app, making sure it works well and looks great. You’ve created some initial buzz, and have some ways to communicate with your customers, and now your app is out on the App Store. What do you do now? How do you get it to sell? This article will focus on step 2 ;] We’ll cover some things you might want to try, from press kits to trailers to app reviews. Keep in mind that there’s no surefire way to success (other than to never give up), so read through and try what you think is the best fit for your app! As an app developer, it’s often tempting to let your app be automatically released as soon as the review is finished, so it’s out on the App Store as soon as possible. Buzz spike on launch date. It gives you a particular day you can market to and have people anticipating your app, allowing you to build some buzz. The first few days are really important, because it’s your best chance to get into the top charts. Time for preparation. It gives you extra time to get all your marketing plans in motion, rather than scrambling at the last minute. Advertising spike. If you choose to go with paid advertising, you can schedule an advertising spike starting on the scheduled release date. Promo codes and previews. You can hand out promo codes in the period between the app being approved and the release date to give people a “preview” copy. This is great for giveaways to reward people who follow your newsletter, mailing list, Facebook page, etc. Sunday? Techcrunch had a recent article that said statistically Sunday is the best day to launch your app. Tuesday? Some people argue earlier in the week is good (i.e. Tuesday), as the press is most active during the work week. Thursday? Some people argue that toward the end of the week is good (i.e Thursday), as there are more downloads on weekends. For more reading, this subject has been debated to death in various forums. A brief description of your app and its features. Remember this is for the press or for publicity so try to synthesize things and keep them short and simple. 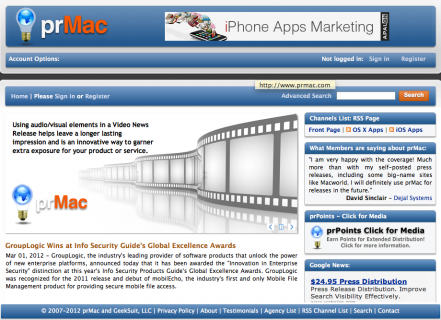 Useful links like Twitter, Youtube account or trailer, website, App Store. Contact emails (this is very important!). Images of the product in action, logos and perhaps high resolution art for any game characters or relevant content. This saves app reviewers a lot of time rather than having to hunt around for screenshots and the other materials they ned while doing reviews. 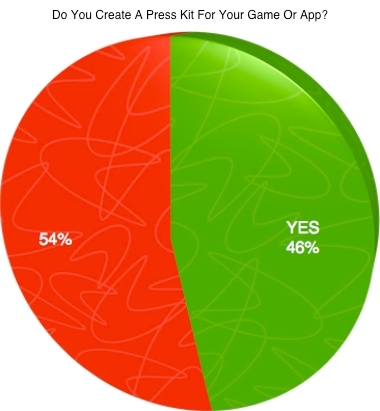 And the easier you make it for the press to do their jobs, the more likely your app is to get reviewed. Many reviewers will use your content verbatim, allowing you to present your app in the best possible way. For an example of a Press Kit, check out this fantastic press kit for Super Turbo Action Pig by Cocos2D developer Chris Wilson. Remember that the idea of a Press Kit is to make info and resources about your product available without having to dig for it. It just makes it easy for any media outlets, fans or bloggers to be able to write about your product and include as much media/information as possible. 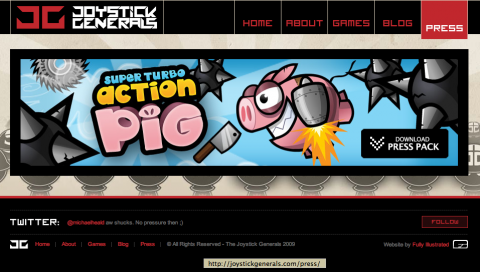 Of course, for this to all work your game/app needs a website! 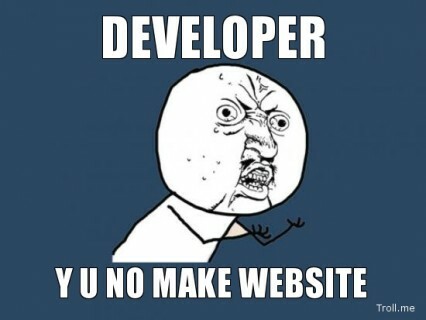 Nowadays it’s how most people get support, contact the developers and find out more information about a product. 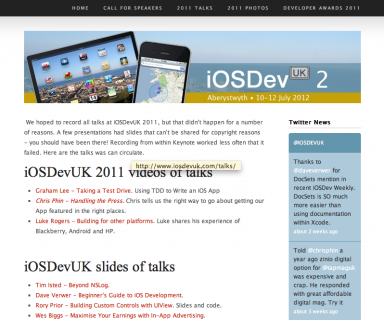 In part 1, we covered some tips and suggestions about creating a web site for your app. A blog or website is our generation’s Yellow Pages, so it’s very important! Note a press kit is not very useful by itself. Don’t let it sit on your website, share it! Post it to the forums your customers hang out in, email it to media outlets, send it to your friends, and tweet it around! Again, some might think this is not really useful or necessary, especially when you consider that this effort could be put elsewhere and be of more help, but this isn’t a lot of effort for you and can reap dividends down the line. Remember that marketing is not about doing a single thing. It’s about using all the tools and resources at your disposal to generate as much buzz and publicity for your product. 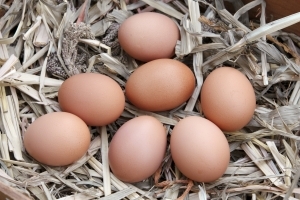 Don't put all your marketing eggs in one basket! A press release is a short article intended for distribution to a wide range of media outlets. As an example, I searched for a recent app release and found this one for Suicide Kings 2 for iOS. The reason why writing a press release is helpful is because a lot of the news and media sites don’t have the time to write long articles about your product (unless it’s the next Angry Birds). Having a press release will allow them to write a short intro, paste your press release, and wrap up the article. Rather than sending out the press release manually, you can use websites like prMac to send out your press release to a wide variety of media outlets for you. Many news outlets automatically post press releases sent by prMac to their websites, and many survey respondents found this very useful in generating more downloads and visits to their websites. Again, this single thing will not make your app be known to everybody out there but it adds up with everything else we’ve been doing. Don’t forget to post the press release on your website. People might visit and find out about your new product there instead of the App Store. Personally, on the App Store the only way I’d find out about your app is if it was featured or in the top app lists. However, if your app is mentioned on some of the websites I read I might find about it that way as well. So, how do you write a press release? 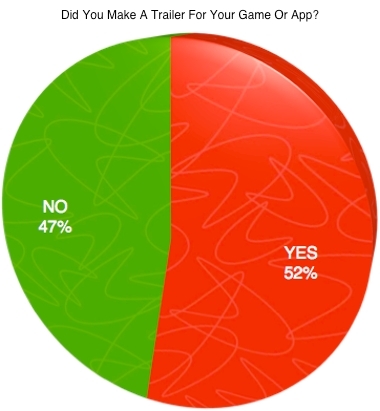 Some respondents suggest writing something brief and informal highlighting your app or game’s unique features. Others have taken press releases of popular products and adapted them to their own product. Don’t be afraid to do this, copying is the best form of flattery and, as it’s been said countless times, “if it ain’t broke, don’t fix it!”. Finally, you can write your own press release as you see fit. There are certain writing styles that are more suited for this purpose but there is no single way to do it. No matter what you may think, making sure your iTunes Store App Page is attractive is one of the most important things you can do in order to achieve more downloads. Potential customers have found your app on iTunes and opened its page for more info. This is hard enough by itself with the current search and sorting methods on iTunes (here’s hoping Apple revamps it in 2012). Now they see the price, screenshots and read the description to see if it’s worth their hard earned money. How can you write a good app description that’s entrancing and will make customers want to buy your app? First, never forget about your target audience, the worst type of response to this is “my app/game is for everyone”…It isn’t! Remember their age, tastes, preferences, hobbies, etc. Appeal to THEM and make sure to awaken emotions within. Make them feel excited, interested and eager to download your app right away. Remember your target audience. As we discussed in above and in part 1! Have a good looking icon. Your icon is more important than you think, dedicate some time (and $$$ if necessary) towards it. Vicki has some game icon tips on her site, and Jeybee has some excellent advice as well. Make decorative screenshots. The screenshots you put in iTunes connect don’t necessarily have to be just direct screenshots from our iPad. You can decorate them with borders, text, and other information. Jeybee also has an excellent article on the matter. Prioritize the first screenshot. Make the first screenshot look particularly good and make the central idea of your app clear, it might be the only screenshot most people see! Localize. Localizing your app description (and app itself) into as many languages as possible is an easy and important way to increase sales. Many people won’t bother to download an app if it isn’t localized to their language. List the features. If someone is on the fence between two apps, they might want to see what one app has versus another. So be sure to list out all the features you think people will care about (but remember the keep it short rule). Your icon should stand out the minute someone is browsing the App Store. This in itself can make someone open your app page, putting them one step closer to purchasing your product. I cannot count the number of times I’ve skipped seeing an app because the icon looks like it was made in a hurry or without any care whatsoever. You could be trying to sell the fastest, most technical car in the world, but if it’s uglier than a brick and isn’t good looking like a Ferrari, no one will even notice it. Screenshots, screenshots, screenshots. Use up all 5 of your screenshots, and decorate them with extra info to make them stand out. Don’t waste screenshots on menus, the about page or a Tweet Sheet (I’m guilty of the latter). I know that sometimes, especially as a single developer, when you finish an app after spending months and months on it, you just want to get it submitted and be done within 10 minutes. Take some time, even a day or two if necessary, to give that final bit of polish to your icon, screenshots, and descriptions. The App Store page can either make or break your product! All of these are fantastic choices and it all comes down to a few things. Mainly your connections and target audience. Social networks are the way to go these days. I love how the guys at Crescent Moon Games or Epic Games always give out promo codes a few hours (or days) before release. They also share codes randomly on holidays or special occasions via Twitter and Facebook. If you have a lot of followers on either one then by all means take advantage of this opportunity. Giving out promo codes doesn’t cost a single thing and, if used properly, can be a great promotion tool. Keeping your loyal customers happy is very important. Social networks offer a fantastic opportunity for a regular person to get in touch with the people who make the fantastic products the use and love. Other options are to contact review sites (like Touch Arcade for games) and initiate a conversation, offer to send a promo code and try to begin creating a network of connections. I wouldn’t advise sending promo codes out without being requested directly for one by an app reviewer, since you never know what you’ll get in return. Not having those codes could also hurt you in the future when you need to send some. Most of the people who said they don’t send out promo codes is because they’ve done so in the past and have never received a review. This is why I suggest you actually contact people at review sites so you make sure they are interested in your product to begin with. 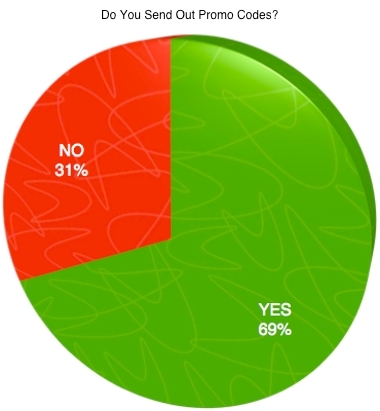 Forums and email are also a great way to share codes or run contests. A contest can help generate a lot of buzz when you release a new product and can attract a lot of first time customers as well. Once again we come to the predicament of diversifying. The use promo codes on their own is most likely not going to yield impressive results unless you have a huge fan base on Twitter, Facebook and the likes. Marketing is all about mixing and exploiting all the tools at your disposal. We’ve already discussed this subject in great detail in the “App Previews” section in part 1, so we won’t discuss this much further here. As obvious as this survey response may sound, if your product is good enough then you will pick up reviews and exposure without trying. Marketing doesn’t just start when you have a finished product, it starts with your first brainstorming session, first mockups, first prototype, etc. You not only have to market your app via promo codes and contacting review sites, your app has to market and promote itself! No one is going to want to review something that hasn’t been thought out well, lacks attracting features, uses a generic and clumsy UI, has bugs! 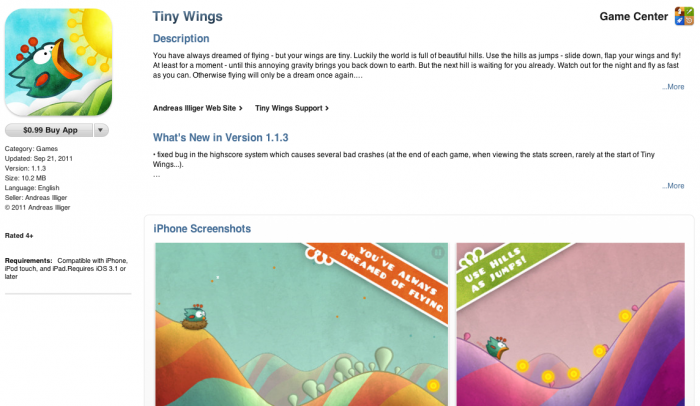 Andres Illiger, maker of the incredibly popular Tiny Wings, never sent a single email or promo code for his app. Heck he didn’t even market his game at all! Despite of this, the product he created was so well thought out, so beautifully crafted, that things just took off on their own. This can happen to your product if you put some thought and effort into it from day one. When you’re first starting making apps, there’s often a gap between what you can do, and what you wish you could do. Check out this inspirational video by Ira Glass, who explained it really well in an interview. Trailers, previews and sneak-peak videos are another great way to get customers excited. This doesn’t apply just for games, there are situations when pictures don’t do an app any justice. You really have to see it in action to believe it! 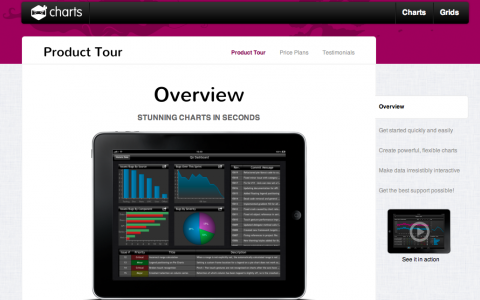 Shinobi Charts is a good example of a product that makes great use of a video. Their charting API is not an App or Game, it’s a tool for iOS developers to incorporate charts and graphs into their apps. By watching a video of it in action, you get a preview of how things work, what the end results look like, how far things can be taken and how smooth it all runs on iOS. Not only does this show the powerful features and capabilities of their API, it allows you to make an informed decision should you decide to purchase their SDK. Our survey showed close to a 50-50 split when it comes to making videos. Keep in mind that making a video doesn’t just apply to games. It doesn’t even have to be a trailer at all! Some apps, because of their nature and what they are supposed to do, are rather complex and robust. A how-to video is a great way to ease your customers into using your product and explaining some of the coolest and/or most obscure features available. Other apps, like Road Inc. or Clear, need to be seen in motion to really appreciate their beauty and unique experience. A few months ago when Clear was being previewed in articles at Engadget and TUAW I thought the interface looked very elegant but nothing more. It wasn’t until I saw a video of the app in action that I was left awestruck. For tips on how to create the video itself, check out the “Creating a Teaser Trailer” section in the first part of the series. Finally, as the comment above suggests, be sure to put your video on YouTube, your website or places where it’s easy to find. YouTube is a fantastic choice because it can easily be embedded (as long as you allow this in your video settings) within any website. This could lead to reviewers or bloggers putting your video on their sites! YouTube also has comments, which allow you to connect with your users, and unlimited bandwidth in case you get 3 million views in a month. This might seem unlikely but trust me, you’ll be thankful that your website didn’t collapse because you exceeded your hosting plan’s monthly bandwidth limit! Making your video easily available is very important both for getting reviews and user feedback and it can be another great way to showcase your product and increase sales! Giveaways are something that can cost you nothing at all but can dramatically improve awareness of your app. A giveaway can be a promo code, gift certificate, clothing or apparel, free apps or software, exclusive content, discount on your apps or games, etc. There are plenty of websites, such as AppAdvice, that are constantly monitoring for price drops and informing users of sales. 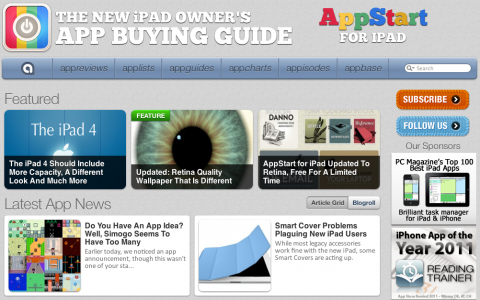 I get daily deals and rebates on Flipboard via AppAdvice and the Apps feed. I’ve found some very good offers I might have otherwise missed and it’s allowed me to find good content for a low price (or even free). Use your imagination when it comes to giveaways. As mentioned before, you can use promo codes on Twitter or Facebook but don’t just stop there. Try cross promotion with other developers and offer to exchange promo codes. This is a fantastic way to build a good network of connections and to help fellow indie/small developers. Lowering the price of your game or application is also something to be aware of, it’s another form of a giveaway and can help boost sales and popularity of your app. You can do this randomly, on holidays, important dates for you and your company, or depending on how your sales are doing. Giveaways and price drops are a fantastic opportunity for you to take control of decreasing sales and keep momentum going. This is where using analytics and monitoring your sales on iTunes Connect can be a lot of help. Remember to always focus on your target audience. Go to forums and websites that belong in your app’s category and announce your price drop or hand out promo codes there. Another great form of giveaways are contests. From simple trivias to drawing contests, they’re all very cool and can bring your user base together. If you are making an awesome game then perhaps the best wallpaper wins a free copy of the game, or a signed T-Shirt with the main character’s image. Whatever you decide to do as a giveaway or contest be sure to do it often. Sometimes, especially when working as a solo developer, we are so eager to release our product that once it’s on the app store we forget about it all together. Your product has a longer life than that. Constant updates will refresh your user reviews and give your app a boost on the recently released iTunes charts. Showing your users that you care about your product is another way to gain popularity and increase your sales. Look at Firemint, they’ve continually updated Real Racing, Real Racing 2, Spy mouse, and Flight Control way beyond what anyone expected. 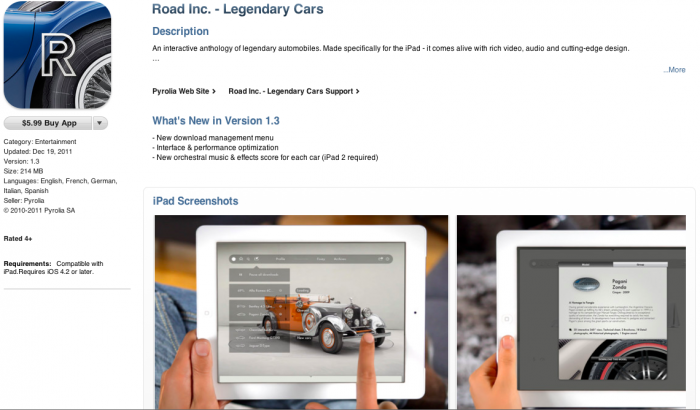 Ton’s of free content, new tracks and maps, using new features of iOS and updating for the latest devices. This on itself is a giveaway, users getting more content and an improved experience for no extra money! Advertising is a tricky one, especially for indie developers. It’s a world of its own and there are companies dedicated solely to this. Just to give an example, even large companies with lots of internal resources, talented people and money, choose to hire an advertising agency for their products and brand. If you are an established developer or studio then you probably have a division or agency handling your PR and advertising. If you are an indie though, here are some tips and suggestions in order to get the most out of advertising. The general consensus among the survey respondents was very few people are actually spending money advertising their apps, and those that are had a lot of troubles getting enough value for their money. Always remember your target audience, especially when advertising. 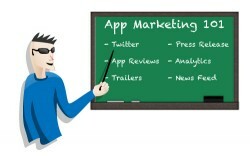 Depending on who you’ve made the app for will determine the type of advertising you will do. If you want to hire an advertising expert or agency, do some scouting. Look at their clients, portfolio, experience and compare rates. Bargaining is definitely something you can do here because there aren’t always fixed rates. Advertising on TV, newspapers or radio is something we barely see with apps. Internet is the way to go for our products. Determine the best places to advertise for your audience. If it’s kids then you might wanna target online websites like Club Penguin or Cartoon Network. If it’s a cooking app you will probably want food.com or blogs/recipe related websites. Facebook or Twitter could also be a great way of advertising. I’ve used Facebook before and it lets you set a budget, target your audience by gender, age, country etc. the great thing is that we know plenty of people are on Facebook so exposure will not be an issue. Being able to establish a set amount of money is also great. Which leads us to our next point. Establish a budget! This is one of the most important things you can do here. Even if you don’t hire an agency or a person to handle your advertising, you should be able to acquire stats from the site you’re trying to advertise on. Ask for info like visits per month, unique hits per month, clicks per banner/ad, prices, etc. This will allow you to compare against other websites and determine where you are getting the best deal. Design a eye-catching, unique banner. Just like your app icon, if your banner doesn’t look good there’s a big chance people will not even bother clicking it or learning about your app. Use some of that advertising money and hire a designer to make two or three awesome banners you can use and be proud of. After buying some ads on a website or doing advertising on Facebook, be sure to acquire stats and info on how everything is doing. Save these stats and analyze them – the A/B testing technique is useful here. Learning from our mistakes is the best way to succeed! Sites like Free App a Day are also ways to advertise your app. Keep in mind they charge you a hefty fee to be included in this site, but it can result in a lot of people downloading and trying your app, which can lead to good word of mouth. The verdict is out for this – some people have found it worth the money, and some have not. Keep in mind that it is mathematically possible to get your app in the top 100 list of an app store just through advertising. It may be worthwhile to spend a good bit of money advertising your app to get it into the top 100 list, for the exposure and continued benefits of being in the top 100. However, you need to be confident that your app has enough staying power to stay in that list once your advertising list ends. In the end, for us independent developers, it’s all about getting the best bang for our buck. We don’t have thousands of dollars to spend on advertising nor can we afford the luxury of wasting 1 or 2 grand. Because of this (and because it’s difficult to get enough sales from advertising to justify the cost), many indies prefer to go with free marketing techniques instead of ads. If you have any good tips or suggestions about advertising techniques that have worked for you, please join the forum discussion below! In this section we’ve covered what you can do when your product is on the App Store or ready to be released. You can certainly be more aggressive here with your marketing considering you now have a complete product (or at least close to completion) and can easily divulge features, screenshots, videos and more without fear of delays or failing to deliver. You’ve also seen some advice from fellow developers on the usage of trailers, promo codes, contests, giveaways and getting reviews! Once again we go back to our mantra of focusing on your target audience. Always keep them in mind when marketing and publicizing your product. You’re ready for Part 3 of this series, which covers a few of the things you can do well after release in order to keep your app alive and maintain a steady number of downloads. 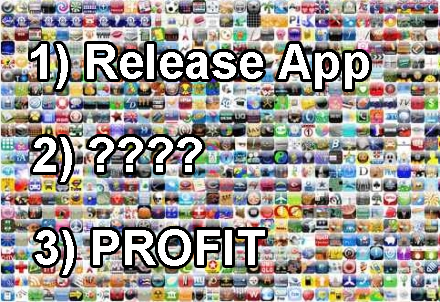 If you have any tips or advice for other developers about effective ways to market your apps in the release phase, please join the forum discussion below!